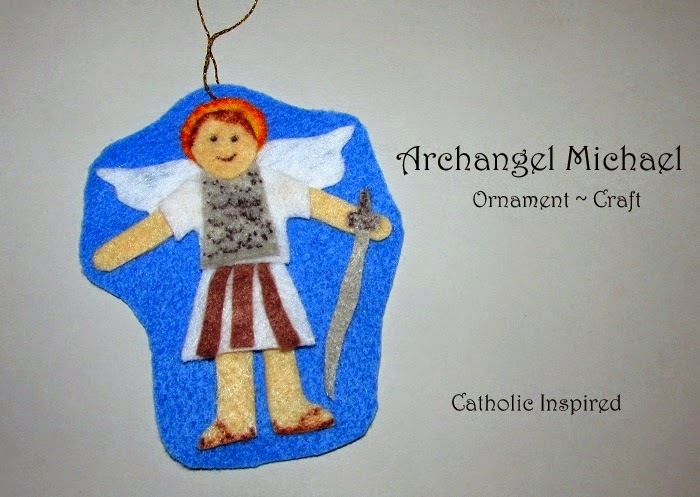 The fast of the Archangels is on Sept. 29th, so Elizabeth made 3 ornaments for this feast day. 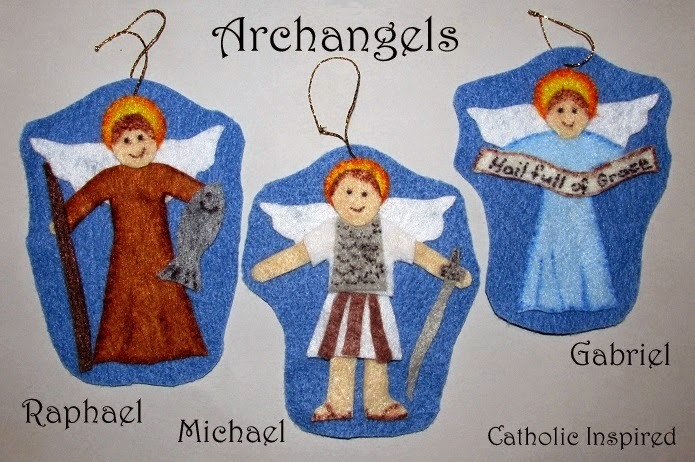 The three ornaments include: Raphael, Michael, and Gabriel. 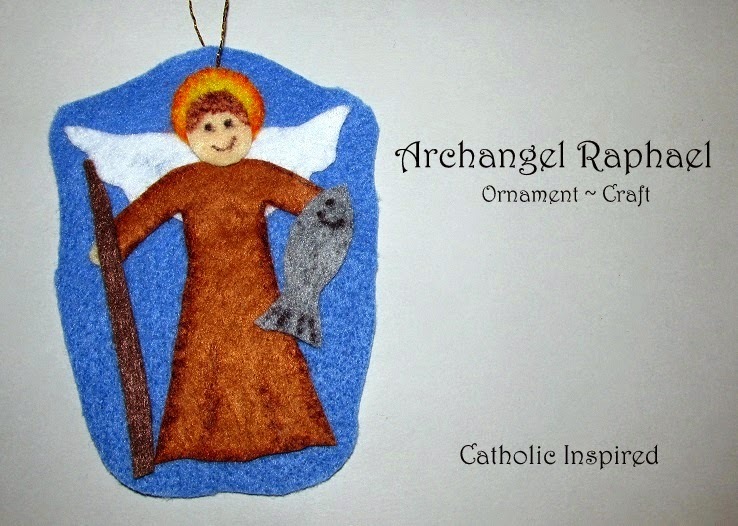 Here are the details for how to create these three ornaments. 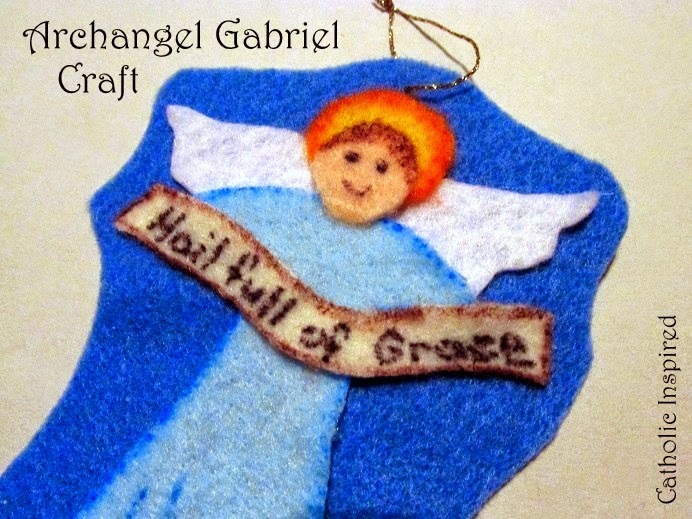 Gabriel's ornament was made with medium blue, light blue, yellow, white, off-white, and peach felt. Cut out all your pieces. We used a light-blue permanent marker to add detail to the robe. We used orange to add an outer edge to the halo. We also added brown marker to the banner edge and we used a black marker to make the "Hail full of Grace". I recommend that you make the letters by using a series of dots rather than drawing them like you regularly would. It helps give them a cleaner look. We also made a face and hair on the head with brown and black markers. Glue down the wings onto a piece of medium blue felt - the blue felt should be larger than all the other pieces. Add the robe and halo over top the wings. Then glue down the head and banner. 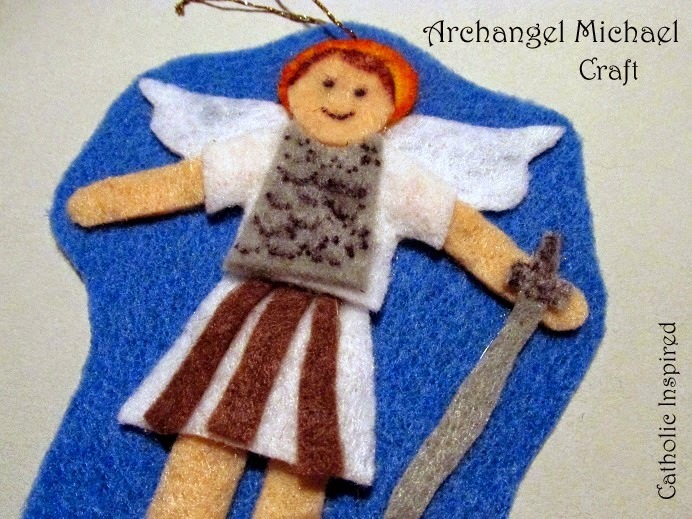 Now cut off the extra blue felt from around the angel. 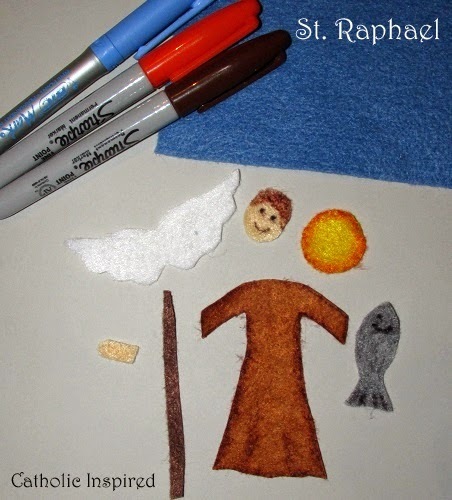 St. Raphael was made with medium blue, medium brown, dark brown, gray, white, yellow, and peach felt. Black, brown, and orange permanent sharpie markers were used to add detail to the robe, fish, halo, and face. Glue down the wings onto a piece of medium blue felt - the blue felt should be larger than all the other pieces. Add the robe and halo over top the wings - don't glue down the arm that will hold the staff. Glue the hand/arm to the back of the robe-arm and then glue that down. Then glue down the head and fish. Add the staff to his hand. 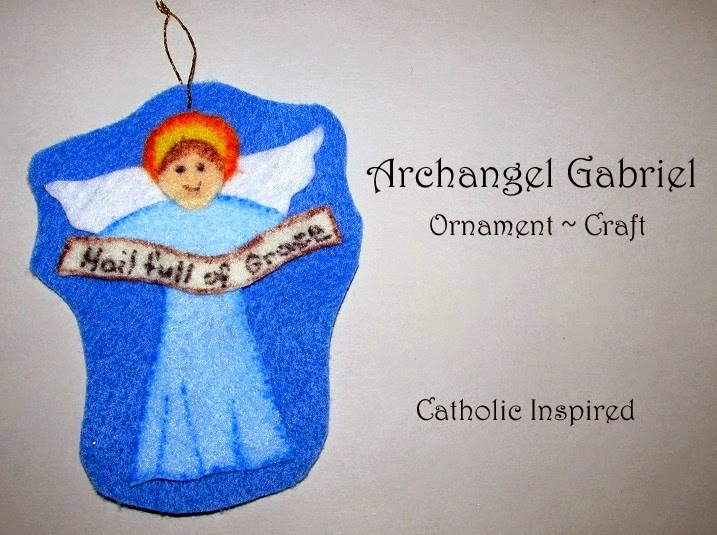 Now cut off the extra blue felt from around the angel. 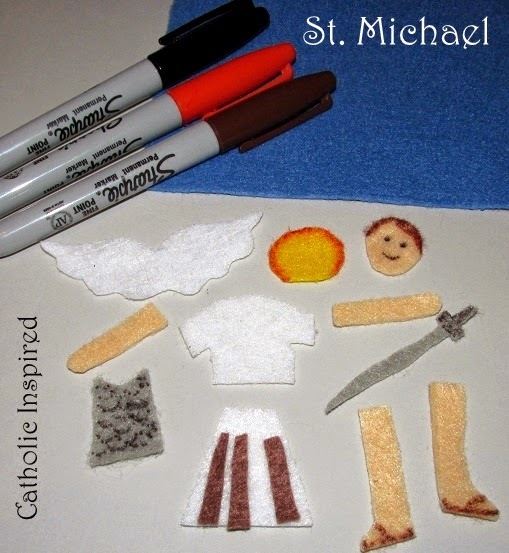 St. Michael was created using peach, medium brown, white, gray, medium blue, and yellow felt. We used black and brown permanent markers to add detail to the face, feet and sword handle. The chest plate was decorated with black marker-dots in a fish scale pattern. We also used orange marker to add the edge around the halo. Glue down the wings onto a piece of medium blue felt - the blue felt should be larger than all the other pieces. Glue down the shirt -only in the center and at the neck. 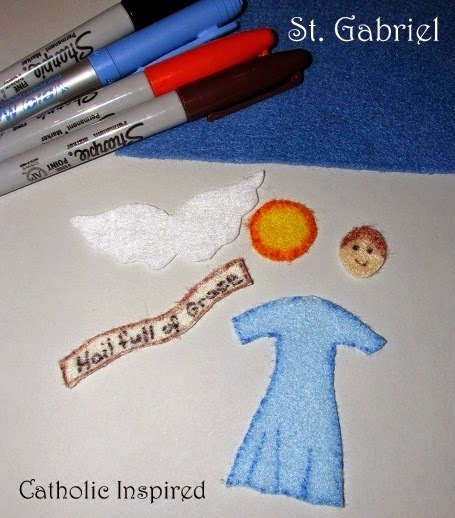 Glue the arms onto the back of the shirt's sleeves and then glue down the arms onto the blue felt. Now add the brown strips to the skirt. Add the skirt to the ornament - glue it only at the waste - under the shirt bottom. Now glue down his legs (under the skirt) and then finish gluing down the skirt, and finish gluing down the shirt, too. Add the halo and head over top the wings. Then glue down the chest plate and sword. 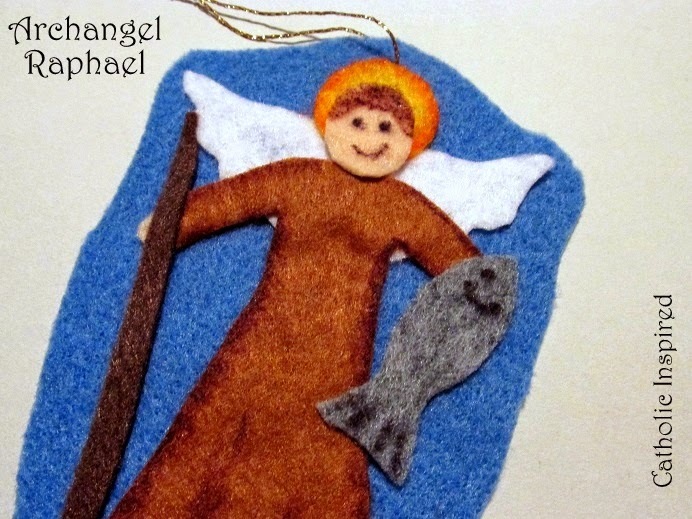 Now cut off the extra blue felt from around the angel. These guys are too cute! They have to be my personal favorite so far! But then again, Elizabeth and I have some really cute ornaments finished and ready to be posted for October! May God shower you with His blessings! Adorable! Thanks for the reminder about their feast day tomorrow too! Your kids are so crafty! Just a thought...Do you ever or would you ever consider doing a "complete" shopping list for us crazy and busy moms at the bottom of the page? These are just wonderful!! Thank you for sharing your gifts. These are all so beautiful and wonderful! If I only could find the time to be so creative and crafty! That's such a blessing that you have a daughter who actually does these crafts with you.